Even with All-Star closer Craig Kimbrel and Cy Young Award winner Dallas Keuchel still available in free agency, the offseason will end on Thursday as baseball kicks off its new year with 2019 MLB Opening Day. All 30 teams will be in action and drafters everywhere are finishing up with a frantic push to get rosters locked in before the Orioles take on the Yankees and the Mets take on the Nationals at 1:05 p.m. ET. 2019 Fantasy baseball rankings are still in flux as MLB news pours in like Francisco Lindor suffering a sprained ankle and Greg Bird starting at first base for the Yankees on Thursday. Every owner's goal is to find the top 2019 Fantasy baseball breakouts, sleepers, and busts who will define their season. Snatching players who will outperform their ADP while avoiding those who fail to live up to their draft position are how championships are won, and reliable 2019 Fantasy baseball rankings are key. So before your draft, be sure to check out the 2019 MLB cheat sheets and projections from the proven computer model at SportsLine. Last year, their model warned that Orioles starting pitcher Dylan Bundy was being overvalued. Bundy was the No. 40 starting pitcher drafted on average in CBS Sports leagues, but finished at No. 68 thanks to a sky-high 5.45 ERA. The team at SportsLine was all over Bundy as one of its biggest Fantasy baseball busts from the start. Their model had him listed much lower than expert consensus Fantasy baseball rankings, and anyone who listened to their advice was well-positioned for a league title. One of the 2019 Fantasy baseball sleepers the model is predicting: San Francisco Giants starting pitcher Dereck Rodriguez. After a strong rookie season where he put up a 2.81 ERA following a late-May call-up, Rodriguez is flying under the radar because he's not a power pitcher. He struck out just 18.3 percent of the batters he faced last season, but his minor-league numbers suggest he can raise that number into the low 20s. Rodriguez has an arsenal that plays above its velocity because he effectively locates his fastball, changeup and curveball. In fact, the model says he'll finish the season as a top-40 option at starting pitcher despite a composite ADP of 90. The model is also projecting Indians starting pitcher Shane Bieber as one of its top 2019 Fantasy baseball breakouts. During his rookie season, Bieber had a 4.55 ERA and pitched 1.25 runs higher than his FIP (3.23) and xFIP (3.30) thanks to a .356 BABIP. As that number comes down, Bieber's ERA should naturally stabilize. If he can avoid over-the-plate misses with his fastball and do a better job setting up an elite slider that generates swings and misses 26 percent of the time, he could be in line for a breakout year. SportsLine's model projects he'll give you more production than players like German Marquez and Madison Bumgarner, who are being drafted an average of two rounds ahead of Bieber according to composite ADP data. As for players to avoid, the model lists Pirates starting pitcher Chris Archer as one of its potential 2019 Fantasy baseball busts. The two-time All-Star appears to be a victim of diminishing skills and an arsenal that lacks variety. Archer is a two-pitch starter who throws fastballs and sliders with very infrequent changeups. He has a tendency to lean specifically on that fastball when he falls behind in the count, which is a major reason why his hard-hit contact rate climbed to 39.4 percent last season. Archer is the No. 32 starting pitcher off the board according to composite ADP data, but the model projects the slide to continue, saying he'll be the No. 67 starter in Fantasy baseball. 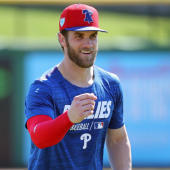 SportsLine has more 2019 Fantasy baseball sleepers, breakouts and busts recommendations, including a third baseman being drafted in the 15th round who finishes top-12 at his position. Value plays like that could be the difference between winning your league or going home with nothing. So which 2019 Fantasy baseball sleepers, breakouts and busts should you target or fade in your drafts? Visit SportsLine now to get 2019 Fantasy Baseball rankings for every single position, all from the model that called Dylan Bundy's huge bust last season, and find out.